Hotwax Media’s newest team member, Designer and Web Developer Jason Nelson, is scheduled to compete in the Ouray Ice Festival Competition next week. Events include a difficulty competition on Saturday and a speed competition on Sunday. This years competition will host an international field of competitors including former champion Ines Papert from Germany. Earlier this year, Jason placed third at the Bozeman Ice Breaker Competition. We wish him luck on this upcoming event. 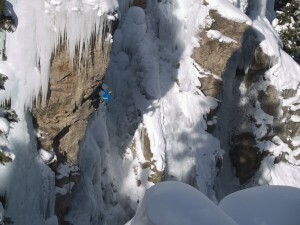 The Ouray Ice Festival, held each year in January in Ouray, CO, is an eclectic gathering of ice climbers, gear manufacturers, and ice climbing enthusiasts. The international Festival was first held in January 1996 and now is widely recognized as the premier event of its kind. Each year, familiar faces return to climb, socialize, test out the latest equipment, and watch the pros power their way up the latest competition route.